Composer and improviser Nicole Mitchell plays the flute, an instrument that can struggle to seem powerful in a world of tenor saxophones and trumpets. But in her art, she wields not just her instrument but also a sense of musical arrangement and context. Mitchell creates musical landscapes and environments. She creates sounds beyond the notes she plays. In 2017, Mitchell came in high on many critics’ “best of” lists with the latest from her Black Earth Ensemble, Mandorla Awakening II: Emerging Worlds. It’s crazy to call this disc any kind of a coming out party for Mitchell, as her discography and resume are long and impressive. Among other things, she was the first female president of the Association for the Advancement of Creative Musicians, with a Chicago pedigree of progressive improvised music that is not kidding around. 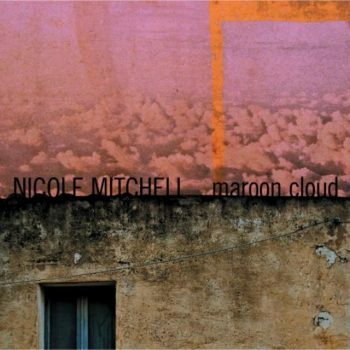 Maroon Cloud uses a new ensemble that features both an old associate of Mitchell’s—cellist Tomeka Reid—and two fixtures of the New York scene in vocalist Fay Victor and pianist Aruan Ortiz. It is an intimate and astonishing collection of music created for (and recorded live at) John Zorn’s Stone Commissioning Series. The absence of a drummer or bass player, perhaps, adds an open feeling to this band, but it is this transparency in the music that makes a potentially “out there” session into something inviting. The first wonderful thing about Maroon Cloud is very simply this: each musician has a gorgeous touch and tone. Perhaps we should be long past the time when more adventurous, “avant-garde” music is assumed to be either ugly to listen to or made by musicians who tend to avoid sounding sweet in any way, but the impression persists. Mitchell’s sound on flute steers fully clear of this stereotype. She plays with a sumptuous, expressive tone that can move from breathy to full without ever seeming ragged. Unless she wants it to. Hearing her bend tones on the opener, “Warm Dark Realness”, is a marvel. She moves from half-step to half-step with a sensual grace, gliding between notes with liquid ease. Reid’s work on cello has a similar elegance. The cello is a famously full-toned member of the string family, but jazz players can get caught in the middle ground: it’s not the pizzicato time-keeper that the bass is, nor is it usually used to play lead melodies like the violin. Reid sounds strong and comfortable at both ends and in the middle—she keeps time like a bass player on “Vodou Spacetime Kettle”, for example, dispensing with her bow, but she is both a sure-toned ensemble member and melodist on “Otherness”. When Reid and Mitchell play unison passages, their intonations and timbres are gorgeously one. Ortiz’s role with this band is that of a connector and colorist, and to some extent as its only percussionist. His pianistic approach is lush and beautiful on most of the compositions, as he lends dramatic harmonies and textures to the way that the melodic voices intersect. There are rarely “solos” here in the classic jazz sense, but Ortiz is a great accompanist throughout, finding ways to corral the sounds into coherent flows of harmony. He is in every sense a drummer on “No One Can Stop Us”, as he joins a ribald dialogue between flute and cello to provide a raggy counter-rhythm that dances and beats out the groove. For sheer enjoyment, the track here that most assuredly grabs the ears is “A Sound”. Mitchell begins it with a dancing flute figure, quickly mimicked by the cello playing with a bow, scraped and drawn. Ortiz quickly locks into this, sounding like a gospel-influenced jazz pianist, channeling the hippest soul-jazz of the 1960s. Victor’s vocal is from-the-gut soul singing, including cries and shouts: “Sometimes a sound represents a whole era! Sometimes a sound represents a whole people!” Mitchell solos over the funky groove, and we glory in the truth that these “avant-garde” jazz musicians are locking into territory that usually belongs to more popular artists—which only makes it more delicious when the quartet takes off freely improvising at the end, retaining the joyful bounce though no longer hewing to soul strictures. The audience at Brooklyn’s National Sawdust explodes with pleasure at the end. Why not? There are other, less obvious pleasures on Maroon Cloud that make this a special recording. The most comprehensive and stunning composition may be “Constellation Symphony”, which is also very soulful but uses plenty of formal compositional elements in sophisticated ways. At the start, Ortiz’s piano and Reid’s cello circle around a single motif, playing with it in part as they approach it but never quite landing there completely. Ortiz’s left-hand hunts for the lick, but his right-hand flies like Bud Powell. Eventually the improvisation shifts to Victor, by which time flute and cello have begun playing a written line that sounds like something from Bartok perhaps. The lick that piano and cello were looking for? They find it just in time for a wild flute solo, and then all the instruments move into specific written parts as Victor concludes the piece with a partly spoken and partly sung section. It is the longest and most ambitious track of the cycle. And it brings it all together. The music on Maroon Cloud shines for various reasons, but its greatest strength may be its collective nature. Soloists do not battle or vie for dominance, and neither do the leader’s compositions insist that they are the stars. There is a gracious blend of improvisation and structure, of careful orchestration and spontaneity, of density and space. It seems characteristic of Nicole Mitchell’s art that she leaves room for all of these elements, spinning like a mobile in balance. Maroon Cloud, with no drummer and an ideal transparency, makes this virtue doubly clear.